Cooper Foldertab lets you become your best organized self. It's both a protective iPad Mini case and an old-school binder notebook that can be used as a planner or a calendar. - Take the padfolio case to classes for taking notes. Write down and brainstorm ideas while using the iPad at the same time. PADFOLIO ORGANIZER WITH IPAD MINI 3/2/1 HOLDING TRAY - Designed to fit Apple iPad Mini 3 (A1599 A1600 A1601), iPad Mini 2 (A1489, A1490, A1491) and iPad Mini 1 (A1432, A1454, A1455). Binder held iPad tray turns like a page in a notebook. Keep your planner, iPad and other documents handy in one case. 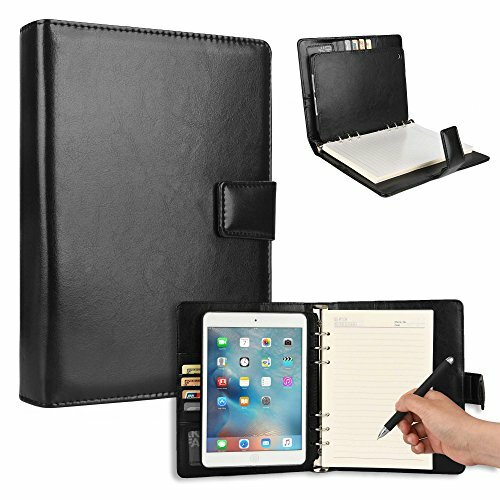 BINDER NOTEPAD REFILLS - Lined paper notepad attached to the binder along with holding tray that securely holds your iPad Mini 3 / 2 / 1. Write and take as many notes as you need! Notepad refills are available for purchase. CRUELTY-FREE VEGAN LEATHER - Premium polished faux leather. Perfect for business meetings and study sessions. Stores all of your belongings in one place. Easy to open magnetic clasp secures all contents so you don't lose anything while on-the-go. MULTIFUNCTIONAL, AMBIDEXTROUS DESIGN - 5 credit card slots & 5 pockets for documents and paper notes. Open binder to easily remove notepad or iPad tray for desired layout. Works for both right-handed & left-handed users. RISK-FREE PROMISE - If this padfolio notepad case doesn't make you more organized or doesn't help you take better notes, then you are entitled to a full refund, no questions asked.